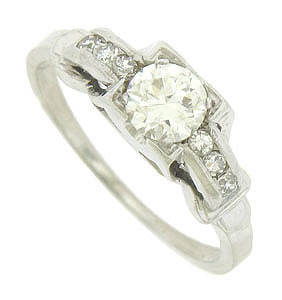 A glittering .35 carat, round cut diamond is set into the center of this handsome 18K white gold antique ring. Trios of additional fine faceted diamonds are set into the ring'shoulders, while abstract organic cutwork adorns the sides of the band. 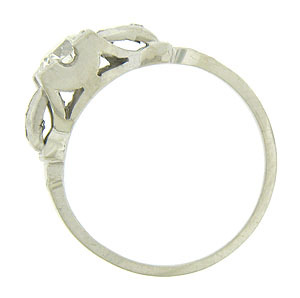 The Art Deco ring measures 5.61 mm in width. Size 4 1/2. We can re-size.